The intention was to grant myself permissions to install gems w/o entering password. I know its insecure, but this is security-vs-convinience kind of thing and I only intended to leave it there for a couple of hours while I do some heavy gem development. Now the sudoers file is broken and I can’t even fix it since I was using sudo to edit it! Use the visudo command. it will check the file syntax before ‘commiting’ it. Then I thought there might be a better way. and only ‘root’ is in the group wheel, so no luck here. I also couldn’t ‘su root’ since my root user doesn’t have a password. duh! 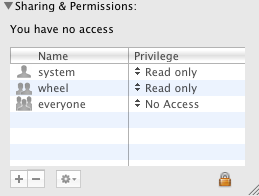 But then it appeared to me that I might be able to circumvent this protection by leveraging my OS X ‘admin’ status. After all it ought to count for something :). Last thing was to restore original permissions on the file in finder.